If a B-movie is a film lacking in craft but overflowing with appeal, what should we call the inverse? A masterful bore? A well-crafted yawn? Whatever the label, The Master is unquestionably a beautifully crafted work, as one would hope for from the director who gave us the majestic There Will Be Blood. The cinematography is as crisp as the camera work is refined, with a hint of David Lynch’s ability to make the sunny seem indistinctly ominous. Performances feel elemental, almost primal, and that applies as much to supporting roles such as Amy Adams’s eminence grise as to the two characters the film orbits around, Joaquin Phoenix as an unstable war veteran and the L. Ron Hubbard-like figure portrayed by Phillip Seymour Hoffman. But all the pieces of The Master do not add up to a masterpiece. If modern art transcends, or falls below, the qualities of representational art, it does so by shifting the burden of interpretation from artist to viewer. In too many cases, the shift is too radical and the work abstracted is to the point where the artist delivers an aesthetic experience that can be either meaningless or meaningful depending on the audience’s charity. This, to me, is why surrealist art is the most satisfying, because it seeks to evoke fluid and intensely personal interpretations, however paradoxical, without fully abandoning the tangibility of representational art. It is the logic of dreams and allegory more so than the logic of reason, and the result of a joint, mutually supportive effort on the part of artist and audience. It is a puzzle with parameters that frame interpretations without fixing meaning, an effort that provides fair game for viewers to play. But I digress. Anderson’s abstract storytelling offers no parameters with which to interpret the film. His work consists of expression without content. Is Phoenix’s Freddie Quell unhinged as a result of wartime experience, or did the war merely aggravate a previously existing disorder? Anderson is not merely mute on the question, but offers nothing with which to achieve a subjective and personal understanding of the character. This is a film populated by characters without biographies and only the flimsiest of histories, speaking in scenes whose only connection is chronology – and even then, the thread is disturbed by flashbacks and fantasies. With characters detached from any sort of narrative cause and effect, individual scenes mesmerize, meander, and sometimes bore…all the while failing to cohere. And so we have an expressive film not only without content but without drama. We have characters who are constructed from scripted words, lacking humanity and delivered by actors through brilliant but homogenous performances rather than discrete portrayals that bend and flex with the narrative’s ebb and flow. Thematically, and I use the word loosely, there are hints of psychosexual disturbances, sublimated homoerotism, and more amidst the power dynamics of the film’s relationships. Yet the film takes no stance and, worse, offers viewers no footholds from which to assume a perspective. Even the film’s similarities to Scientology, and the inspiration it draws from Hubbard’s life, achieve no force. The comparison between the film’s “Cause” and Scientology provides context, perhaps, but is irrelevant and coincidental otherwise. Just as Socrates commented that the unexamined life isn’t worth living, a film that leaves its topics and characters unexamined isn’t worth thinking about. 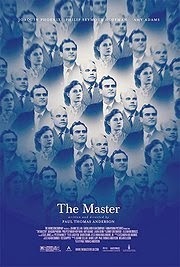 The Master baits audiences with the promise of profundity, but confuses emptiness for enigmatic.